Jamie Dimon: "Rebel With a Very Pinstriped Cause"
This week's New York Times Magazine features a cover story on United States banking golden boy Jamie Dimon, otherwise known as the chairman and CEO of JPMorgan Chase. Dimon allowed The End of Wall Street author Roger Lowenstein into his "inner sanctum," giving Lowenstein "an insider's view of how he thinks about banking and how he runs the bank." According to Lowenstein, "The executive I encountered was on a mission to reclaim a respected place for his industry, even as he admits that it committed serious mistakes." "Dimon grew up in Queens, the grandson of a Greek immigrant who rose from bank clerk to stockbroker, a profession also taken up by Jamie's father. At home, Jamie absorbed a first-generation reverence for America and the stock-market wisdom of Benjamin Graham ... Teddy, his twin, recalls a superconfident sibling who always wanted the ball when the game was on the line." "On weekends, he consumes a mountain of printed material; he arrives on Monday with a penned list of questions for subordinates (he carries the list in his breast pocket, crossing off items as he grabs people in the hallways). He regularly grills the executives in J.P. Morgan's six business units over every possible contingency; he personally monitors the bank's largest credit and trading exposures." "Dimon is a famously bad listener. He interrupts and finishes people's sentences." "At 54, Dimon remains trim, and though his hair is salt and peppery, there is something boyish — a puckish, faintly suppressed grin — in his manner. He speaks hurriedly, almost garbling the words, clutching a coffee cup while jabbing the air with his free hand. Colleagues marvel at his accessibility and his seemingly perfect recall. 'You go in his office, there is almost nothing on his desk,' says Steve Black, a longtime colleague. 'He reads it and remembers.'" "Dimon has a reputation as a cost cutter; it's a term he hates and one that obscures his protective feeling toward the organization. Linda Bammann, who served a stint as deputy chief risk officer, recalls that when he hired her, he took her to dinner and said: 'Every single person in this firm is our responsibility. If we ever have to lay people off, it's because we haven’t done a good job.' No one would call Dimon cuddly: he is profane, snappish and sparing with praise." "Dimon's mantra is 'Do the right thing.' That might sound like a corporate bromide, but it informs his view of how to run the company, from dealing with problems directly to trying to make gay employees at his firm feel comfortable. Dimon seems incapable of stifling unpleasant news; this translates, at a corporate level, to a rare emphasis on transparency." "A lifelong Democrat, Dimon supported Obama in 2008. After the election, he wrote thoughtfully on financial reform. His suggestions were not the stuff of a banking apologist; arguing that the system of bundling mortgages into securities had to be revamped, he wrote to shareholders, 'We cannot rely on market discipline alone to fix this problem.'" "There is a picture in the Dimons' Park Avenue home of James Dean in a sidelong pose and a leather jacket; it reminds Judy Dimon [Jamie's wife] of the contrarian business-school student who also wore black leather and seemed, even as he raced up the corporate ladder, not quite establishment. 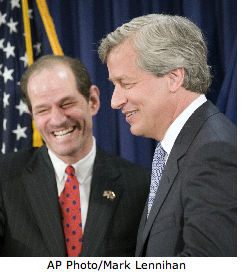 Jamie Dimon, of course, is a rebel with a very pinstriped cause." "Although he supports most of Dodd-Frank, Dimon says he wishes Congress had thought more deeply about the role that big banks — and big corporations generally — play in society. Unprompted, he declared, 'There is a huge misunderstanding on how the economy works, how Main Street and Wall Street work.'" "Last year, J.P. Morgan financed the acquisition by Kirin, the Japanese brewer, of a beer company in Australia as well as a Brazilian purchase of a steel company in the United States. It will have to do more such deals to get the international share of its corporate business to half from its current 30 percent." "Dimon has yet to fulfill one of the primary tasks he was hired for: to generate enduring wealth for shareholders. Since he arrived at J.P. Morgan, in 2004, the company's stock is flat, a dispiriting result that the directors surely didn’t anticipate. His achievement can be measured in terms of the trouble he avoided — the average bank stock, over that time, is down by half." Pay Practices on Wall Street Have "Worsened"